Happy days! You’ve got a 5 day break and you have decided to explore the South Island starting off in the Garden City – Christchurch. If you’ve never been to Christchurch before, it’s definitely worth spending a few hours exploring the South Island’s largest city, however we’re going to get you straight on the road and hopefully leave enough time at the end of this 5 day itinerary for you to explore some of the delights in and around Christchurch – for now though it’s time to hit the road. Let’s GO! So, you’ve picked up your shiny new GO Rentals hire car and you’ve got a 5 day adventure ahead of you which is going to include glaciers, rugged beaches and the adventure capital of the world – sounds pretty epic already! Heading out of Christchurch your journey today is going to take you all the way from the East to the West Coast via the spectacular Arthur’s Pass. This is the only road to take if you want a real road trip and what better way to start this journey. The pass rises up to over 900 metres as you cross into the Arthur’s Pass National Park with stunning scenery on all sides. The road itself is an engineering marvel as it cuts through the Southern Alps. One of the most popular ways to travel the route from Christchurch to Greymouth is on the Tranz Alpine Rail Service and the road runs alongside the rail tracks for much of the journey. Arthur’s Pass Village is a great stop off point on your journey and a great chance to stretch your legs. Although this 5 day itinerary does not allow time for a stop, there are plenty of places to stay up here if you fancy heading out for a hike. There is time for you to do the 1-hour leg stretching loop to the Devil’s Punchbowl Falls before you start to head down towards the West Coast. Hmmmm pancakes as Homer would say! Although your day is going end in Greymouth, we highly recommend a detour north to end your day. These 30-million-year-old limestone formations are nothing to be scoffed at. They’re towering cliffs of rock which really do look like a sky-high layer of grey pancakes stacked one on top of the other. We reckon Homer would be pretty happy with these bad boys. With a well-maintained path leading out to the best spots, this is a great chance to see the huge waterspouts that blast out towards the sky from blowholes. It may be late by the time you arrive in Greymouth depending on what time you hit the road in Christchurch and despite this being a popular transit stop for those taking the Tranz Alpine, there is still plenty to see and do in the area and probably the most popular is the Monteith’s brewery tour and tasting. Monteith’s is one of NZ’s most famous exports and the master brewers will talk you through the process of creating multi-award winning beers…and then you’ll get to try them for yourself. Winner. On yer bike! Adventures also offer some fantastic off-roading fun in their quads, go-karts, argo and hagglunds through amazing rainforest trails and flowing creeks. If you still haven’t checked out the gold mining history in these parts, GO Play partner Shanty Town offer a 5% discount for a tour back in time – definitely worth a look. An early start awaits you if you are to fit in all the activities on this action-packed itinerary! It’s just over 2 hours to get to Franz Josef where you can pick from a number of glacier-based activities so you had better get your skates on! Hokitika (what a great name… go on, say it again!) is the last ‘big’ town you’ll pass on the drive south from Greymouth but make sure you don’t just drive on by. Hokitika is NZ’s major centre for the working of greenstone. Why not get involved yourself and try some jade carving at the Just Jade Experience? You and the GO Rentals car should be getting to know each other by now so before you know it, you’ll come across Lake Mahinapua which offers a fantastic stop off point for a picnic and a stretch of the legs. Once a coastal lagoon it’s a lovely place for a swim and the water is surprisingly warm. A great place for families, there is a suitable wading area for young children and bigger kids love jumping off the jetty or launching a canoe to explore. For the twitchers out there, you’re likely to see black swans and mallard ducks and if you’re extremely fortunate you could also spot a magnificent white heron or the rare fern bird if that floats your boat. There’s a number of short walks or if you have the time try the two hour Mahinapua walkway which traverses board-walked wetlands and forest following an historic logging tramway. The final pitstop before you hit Franz Josef should be at Ross (27.2km – 22 mins from Hokitika) which was made famous in 1909 when NZ’s largest ever gold nugget was mined weighing in at an impressive 2.807kgs. Your drive from here cuts back inland, passing many beautiful lakes before finally arriving at Franz Josef (107km – 1 hour 23 mins). 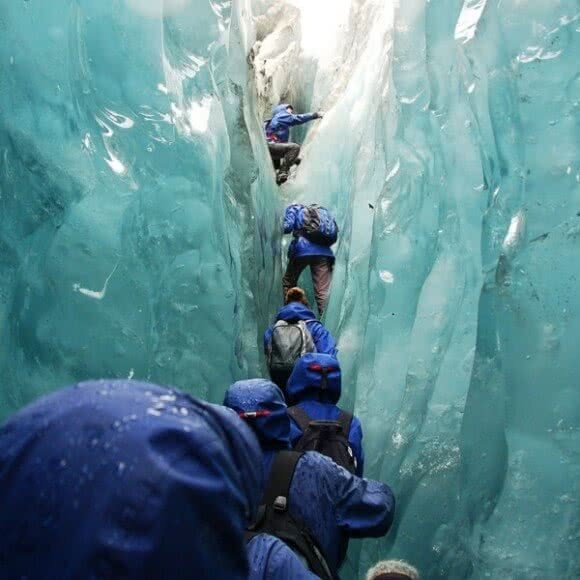 The Glacier was first explored in 1865 by Austrian Julius Haast and it has been advancing and retreating ever since and now it’s your chance to get up close and personal with a variety of activities to tickle your fancy. Without a doubt the best way to experience the glacier is to walk on them. Small group walks with experience guides and equipment provided (amazing socks!) can be booked in the town of Franz and offer half or full day trips up onto the glacier. We cannot recommend highly enough taking the full day hike as this will allow you to get further up the glacier with the chance to find new routes or even undiscovered ice caves. With your crampons on and your ice picks at the ready, this is another great snap for Facebook to show you as the true ‘explorer’ so don’t miss out on this one. 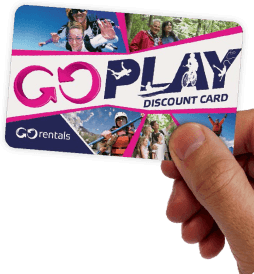 Franz Josef Glacier Guides are also a partner of GO Play, offering a 10% discount for guided tours on the ice – cool! For those with a few more dollars to spare, a heli-hike offers two fantastic opportunities; see the sheer scales of the glacier from the skies but also get onto the glacier much higher up where the ice is much purer. Here you’ll get the chance to discover blue-ice caves, seracs and pristine ice formations and let’s face it, a trip in a helicopter is pretty cool. Taking things one step further, Aoraki Mount Cook is within reach of Franz by helicopter with a number of companies running tours to see the highest peak in NZ. These tours can often be combined with a heli-hike on either Franz Josef of Fox glacier and is the ultimate Southern Alps experience. If you do head out on one of these amazing trips, be sure to let us know so we can all be super jealous in the office! There really is no better opportunity to snap yourself the perfect photo for our GO Snap Happy competition, looking all adventurous with your ice axe and crampons! After a day on the glacier, today is going to be about the driving and some spectacular scenery (don’t worry, these GO Rentals hire cars love a good run out!). The drive to Queenstown takes you down the West Coast before cutting inland along the Haast Pass towards Queenstown. There are some spectacular view points on the way but be sure to pick one or two or you may never arrive in Queenstown! As you head out of Franz Josef, one stop that cannot be missed is a detour to Lake Matheson. If you’re looking for the photo to put on Facebook to make all your friends jealous, then this is it. 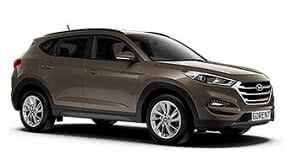 Better still, send your photo in to our GO Snap Happy competition for a chance to win back the cost of your rental – can’t say fairer than that! Take the road west at the popular Fox Glacier township and you’ll be rewarded with views that take your breath away and make you question why you ever want to go back to whatever it is you do when you’re not touring round NZ’s South Island. 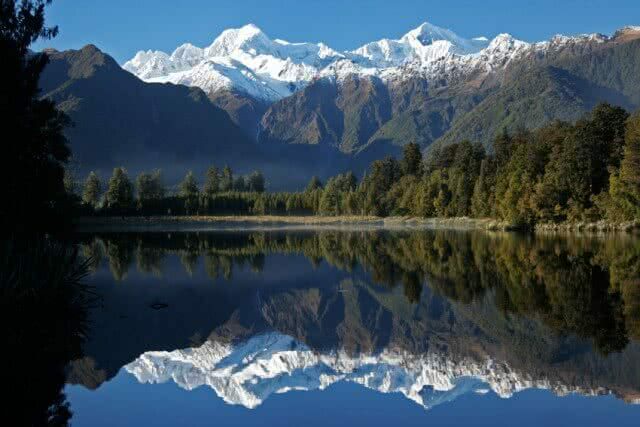 Famous for reflecting a near-perfect image of Aoraki Mount Cook in its waters, Lake Matheson was formed around 14,000 years ago when the Fox Glacier retreated from its last major advance towards the sea. If we had to guess, we reckon you’ll end up with 39 photos give or take on your camera – the best view is always just around the corner! As you carry on down the Haast Pass, there’s loads of forest and lakeside walks you can take along the way depending on how you’re doing for time. Lake Paringa offers a great pitstop location for lunch with some stunning scenery in all directions. The highway then makes its way back out to the coast at Bruce’s Bay and a stunning drive awaits. Enjoy the views along the rugged coastline as this is your last chance to take in the splendour of New Zealand’s West Coast – it’s soon time to turn east and head inland towards the lakes and mountains. Be sure to stop off for the walk down to Monro Beach just before you hit the Haast Pass going east where between July and December it’s possible to see the tawaki (Fiordland crested penguin). Make sure you cover up though as the venomous sand flies can be brutal at most times of the year. From here, your GO Rentals beast should be singing along as the road takes a meandering route through the Mt Aspiring National Park and on to Wanaka. Just north of the Makaroa Tourist Information Centre is a hidden gem (not so hidden since it made it into the top 10 things to do in NZ list!) for Kiwis and tourists alike. The Blue Pools walk can be accessed directly from the Haast Pass and is well signposted along the route. Follow the track into the forest where you’ll find a series of crystal clear pools that have been carved out of the rocks by centuries of erosion. The glacier-fed water in these deep pools is the colour of deep azure blue, and so clear that you can see right to the bottom. Jumping in looks tempting but it’s not advised as it will be a particularly cold shock to the system as well as upsetting the resident brown trout and you don’t want to mess with a brown trout unless you like a wet face slap. From here you still have around 140kms ‘til you hit Queenstown which will take you around 2 hours. AJ Hackett was the pioneer of Bungy across the world, and the Kawarau Bungy was the first commercial bungy in the World. However, it’s the Nevis Bungy which is like no other. The Nevis is Australasia’s Highest Bungy with a 134m (440 feet) drop and 8.5 seconds of freefall the ground rush is like no other. Getting there is an adventure in itself with a 40 minute drive off road through a sheep station and then you find yourself dangling on a high wire cable across a large valley – for true adventure junkies, this is the ultimate thrill. Get ready for the thrill of a lifetime with New Zealand’s world famous Skipper Canyon Jet – the ultimate jet boat experience. Reaching speeds of up to 85mph, feel your adrenalin surge as you accelerate into the towering Shotover River Canyons. You may think that the driver is a lunatic, but rest-assured, he is an expert and will have you skimming over the shallows, doing 360 degree spins and take you closer to the edge of the high sided canyon walls than you would think is possible! Skippers Canyon Jet is also a GO Play partner. Bonus! Coronet Peak is New Zealand’s top Ski Resort. Whether you’re a seasoned downhill pro that would give James Bond a run for his money, or a mere novice who wouldn’t know a snowboard from a surfboard, you’re sure to have a ball here. It’s only 25 minute drive from Queenstown so give it a go. The Apres-Ski can be good fun too! Accessible from the town centre is the 4+ hour walk to the summit of Ben Lomond. With awesome views of the lake and mountains as well as the summit of Mount Aspiring, this walk is perfect for those who have just landed and want to get an idea of the geography of the area. If you’re fit, consider hiking to the top of Ben Lomond summit for an extra-special panorama. Don’t forget the camera! For those who want the best of both worlds, give the Skyline Gondola a go. The luge is a fantastic place to take the kids, grab a picnic and let the racing commence! We also reckon the top of the gondola is one of the best places to take a date – amazing views which will blow them away – go on, give it a go! Hop in your GO Rentals Car and in less than half an hour, you’ll find yourself in historic Arrowtown. It was the heart of gold rush territory in the south and a true step back in time. At the heart of Arrowtown is Buckingham Street, a tree-lined step back in time dotted with shops, bars and great places to eat with no international chain store in sight. If you want to get out and stretch your legs, there are some great walks and biking tracks which can be accessed from the town centre. At the end of a busy day, Queenstown is a great place to unwind with a huge range of bars to suit everyone. Depending on the time of year, you will either be welcomed in to a roaring fire or sit out enjoying the sun setting over Lake Wakatipu. So, the last day of your epic adventure and it’s a big day behind the wheel with close to 6 hours of driving ahead. The good news is there are some good stop off points along the way. And the scenery is spectacular as you head up through the Canterbury Plains. Located 75km south of Christchurch and known by locals as the ‘Riviera of Canterbury’, Akaroa is a great stop off as you head north towards Christchurch. This village is located on Banks Peninsula within a harbour of the same name and is considered “the most French town” in New Zealand, as it was the only French settlement in the country. Spend some time exploring the small town and then head to the harbour for the best fish and chips meal of your life (at least that’s Akaroa’s claim so you be the judge and let us know). There is also an opportunity to tick off one of the things that appears on may people’s bucket lists – swimming with dolphins. Black Cat Cruise offer the chance to swim with the very rare Hector dolphins which are only found in these waters and with a GO Play discount of 10%, you’d be a fool not to! The final leg of the journey today will take you 81.3kms to Christchurch via Lyttelton. On the approach to Christchurch, a stop off a Lyttelton is well worth the detour and it’s a great place to grab some dinner if you’re arriving late in the evening. Hit by the earthquakes, Lyttelton has now rebuilt and is a thriving village with lots of bars and cafes – there’s a great road over to Lyttelton which offers you some fantastic views looking down to the city and the harbour as well as down to the Southern Alps – a great way to end your road trip. Before you drop off your GO Rentals car, one thing we can definitely recommend is the International Antarctic Centre which is located a stone’s throw from the airport. Wrap up warm and experience a true Antarctic storm in the specially designed room which even features a snow slide before heading off to see the cutest little penguins you will have ever seen in the penguin encounter. Finish your visit off with a hagglund ride and you can be sure this will be a trip not to forget. Brrrrrrrr.